After assuming I’d have to wait another 15 years to get to shoot another destination wedding, along came Jennifer & Kevin, who enjoyed a beautiful beach wedding at the Royal Haciendas Resort in Playa Del Carmen near Cancun, Mexico. I particularly liked the sand ceremony, where after the couple combined sand into a small bottle, each of their guests added a small shell to the keepsake. They recessed to a punk version of “Ring of Fire,” which set the tone for a fun evening of fiesta, and a most spectacular moment provided by photographer Angela Talley‘s hubby Chris that will be talked about for years to come. We were all looking forward just as much to the following day, when Angela and I took the couple and their entourage to a breathtaking stretch of the Riviera Maya for an amazing “Trash the Dress” shoot, which ended up with all of us waist deep in the beautiful turquoise water. Jen & Kevin topped it all off by frolicking with the dolphins at Puerto Aventuras. Needless to say, I had an amazing time with the Talleys and their extended family who joined us for the adventure, and I cannot thank Angela enough for talking Jen & Kevin into letting this very lucky videographer tag along! While I was in Mexico covering a wedding with photographer Angela Talley, Monica Richard of Detail + Design called us to ask if we could provide video and photos of Jennifer & Mike’s spectacular 11/1/08 wedding to submit for a PACE (Professional Achievement in Creative Events) award. The entries are judged by fellow ISES (International Special Event Society) members around the country. Little did I know that that phone call would result in IndyVisual winning our first-ever PACE Award! 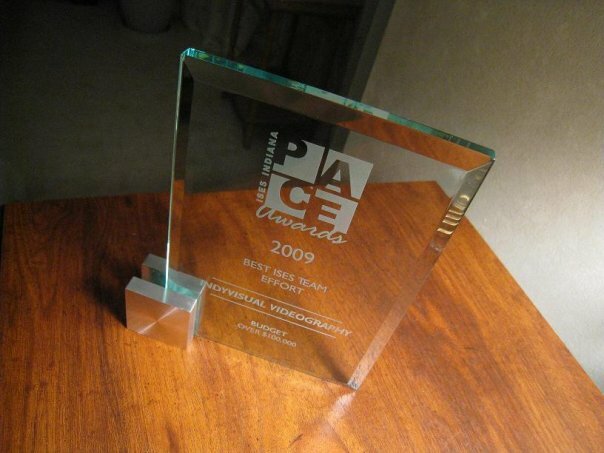 The award was for Best Team Effort (Budget over $100,000), and was handed out recently at the 2009 PACE Award Ceremony & Celebration at the Scottish Rite Cathedral. Our friends at Thomas Catering and Detail + Design asked if I could bring a camera to the event to capture some of their food and decor, and I was more than happy to oblige. Here’s the video – I even managed to squeeze in a few fun people shots!